When SL Style Director Heather Chadduck lost a 100-year-old hickory tree in her backyard, she knew it was time for a makeover. A vine-covered pergola and cozy outdoor fireplace transformed her Birmingham backyard into a chic outdoor retreat. Humble materials can pull off a high-end look. This backyard transformation began by installing a 10-foot-wide by 30-foot-long iron pergola. Then, wisteria was planted, which in time turned into a leafy canopy overhead. To anchor the space, an outdoor fireplace was constructed from cinder blocks lined with fireproof brick and covered in stucco. 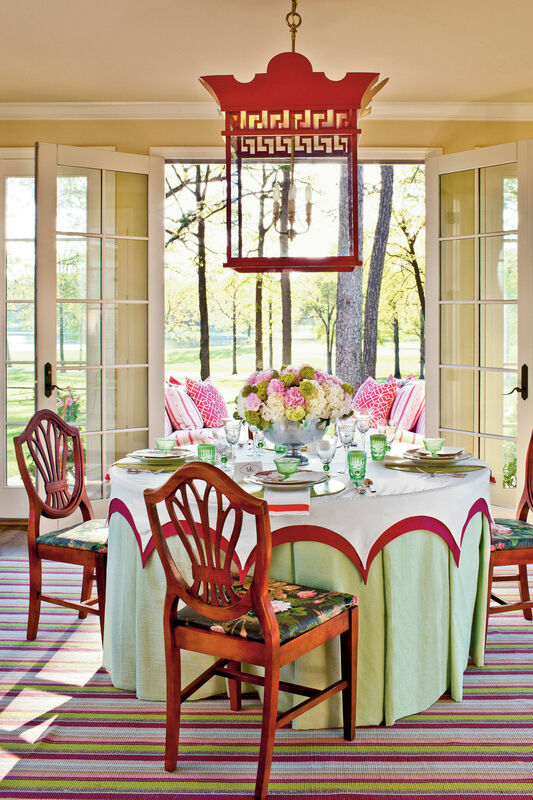 And all the furniture and accessories that decorate the space were chosen to withstand the elements but age gracefully, resulting in an inviting spot for alfresco entertaining. Without landscaping or outdoor seating, this backyard felt overgrown. Lacking shade and a gathering spot, the yard was an impractical eyesore begging to be overhauled. If you want guests to linger, offer comfortable seating (like the armchairs by the fireplace) that's covered in weather-resistant fabric. Heather's father used pressure-treated pine to build her a simple trestle-style table. Painted French Gray by Farrow & Ball, the table seats 14 and measures 17 feet long. That length made it exactly 1 foot shorter than a standard sheet of copper, allowing her roofer to easily wrap the tabletop in the material. Peel off the labels of pickle and okra jars, and use a cord kit (paperlanternstore.com) to illuminate each one. Equipped with a dimmer and hung at varying heights, they provide the ideal mix of rustic and industrial. Unlike quickly sprucing up a room with paint, landscaping rarely yields instant gratification. (Heather's wisteria canopy took four years to mature.) Research plants on the front end so you can have a realistic timeline for their growth. Fig leaves clipped from the yard fill Heather's collection of wicker-wrapped wine jugs. She scattered them down the table for a simple centerpiece that naturally complements the space. Heather laid mesh-backed strips of river-rock tile from a home-improvement center in a large-scale diamond pattern and then had concrete poured to fill the centers for a patio floor that only looks high-end. The river rock breaks up the expanse of solid concrete beautifully, and it cost her far less than custom tile or stone. 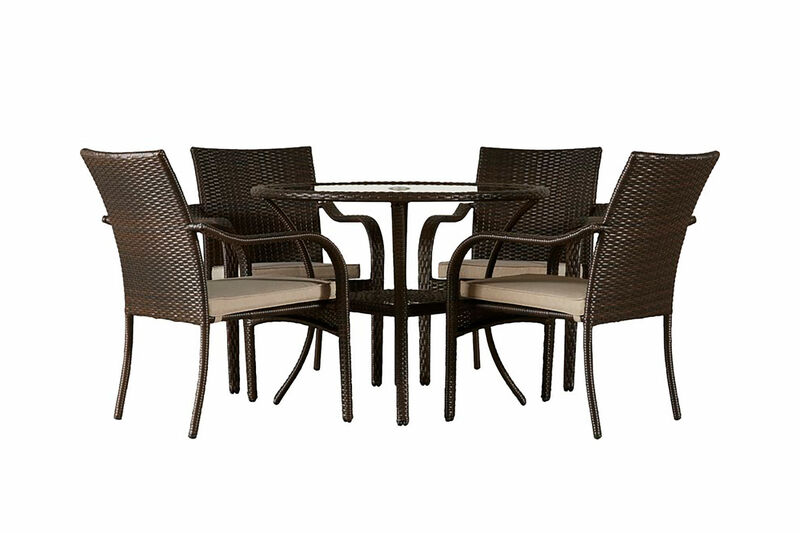 Outdoor furniture is often sold in suites of tables and seating all in identical finishes. While it's pretty, you'll end up with a patio that looks right out of a catalog—and possibly just like the one next door. Mix it up with tables and chairs of various materials and finishes for a setting that will appear collected over time. Exterior lights do more than set the mood. Incorporating a mix of overhead, side, and up lighting allows you to vary the atmosphere, as well as highlight your table setting, architectural features, or a lush canopy of leaves and branches. For even more ambience, light a fire, top tables with candles, and scatter lanterns throughout.